Jeremy Haladyna just might be the foremost musical alchemist in the Americas. Because, for a decade he’s been quietly turning the laws of the Mayan calendar into music—in different ways. Thanks to him, it’s possible now to listen to the Mayan calendar. And if hearing the calendar doesn’t suggest Mayan legend and ritual turned into gold, you’ll be hard pressed not to hear rats, armadillos, snakes and sacrificial blood, which all run through this music in due course. Leave it to the pioneering label innova to feature the one-of-a-kind and newly hybridized. 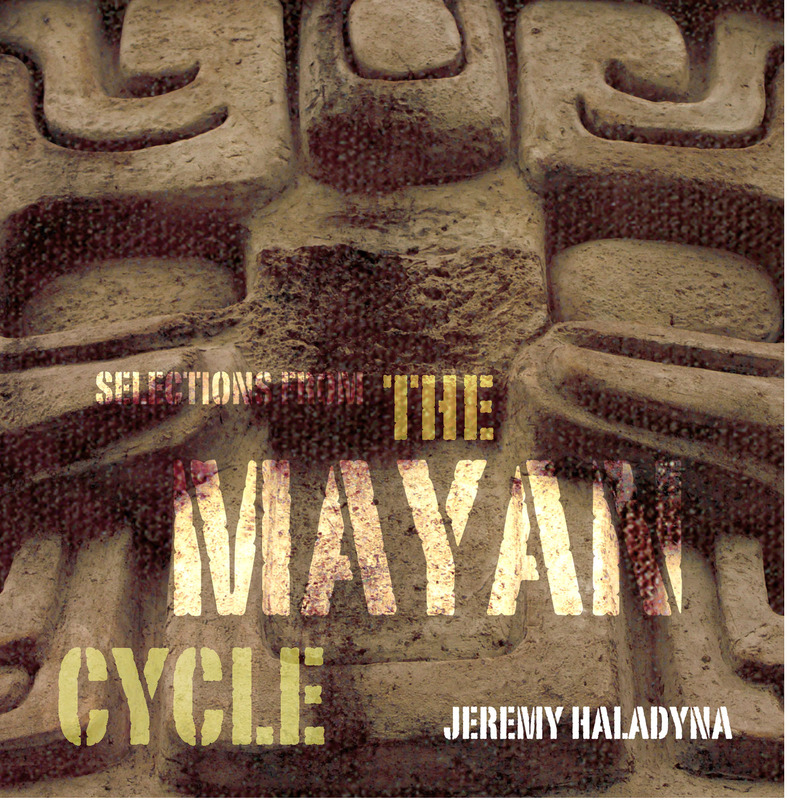 Over twenty years and eight visits to the Mayan region, American composer Jeremy Haladyna of UC Santa Barbara has ventured ever more deeply into the magic and mystery of Mayan culture, and given something back in the form of his unique body of work, THE MAYAN CYCLE. Spanning media and genre, from a single instrument, to voice, to computer, to DVD-audio, to full orchestra, this wide variety of pieces seeks to address everything from the most ancient roots of Mayan cosmology to contemporary Mayan political struggles. The new musical scale Jeremy Haladyna crafted in 2006, born of the luub, or Mayan zero point, is the grit and substance of the opening track on this just-released CD. Virtual guitar, disembodied voices (as well as howler monkeys painstakingly tuned to match them) sing notes literally plotted on the motions of Earth, Venus, and the Mayan sacred almanac. We imagine we hear an old Mayan daykeeper ritually counting to thirteen, the mystical Mayan number, in the distant background. This is Borgia, one third of Haladyna’s startling work in these new cosmological notes…Demon Zero. A scratch turntable—manned by the composer—is turned to entirely new ends as it impersonates the wheels of Mayan time in Demon Zero, then turns impish as it plays armored armadillo in Only Armadillos They Danced, partnering with string quartet. The story here has the Hero Twins from the Mayan Popol Vuh entertaining the Lords of the Underworld, whom they will soon outwit. The same Popol Vuh holds the inspiration for a companion piece, also on the CD, about their rodent ally, Precious First Rat. Haladyna’s Snake Mountain from Tollan has the oboe sounding like Medusa as it and pipe organ entwine in a mystical dance. The context of “The Place of the Reeds,” [Tollan] is so shrouded in mysterious, distant legend that even the ancient Maya could only half recall it: we hear music invoking a place where the patron gods of Mayan cities were born. These are colorful and alive performances, well matched to Haladyna’s exotic music honing in on each conceptual core. Relish the medal-winning performance by Areon Flutes of Godpots (Ollas), on a Lacandón rite, recorded at the 2009 Fischoff Chamber competition. You won’t hear a greater variety of flute sounds—all flute sizes plus ocarinas—on any other single track elsewhere. Lisa-Maree Amos of Orchestra Victoria [Melbourne] excels in Precious First Rat, where her gamboling alto flute is paired with Haladyna’s celesta. UCSB’s Young Artists String Quartet calmly plays the foil to the armadillo in Only Armadillos They Danced, while Sergio Ortiz of Mexico’s Concertistas de INBA narrates the chilling Puczikal Peten (Hearts of Yucatán). L.A. recording stalwart Michele Forrest is likewise transporting in her sailing melodic work on Snake Mountain, and starkly frightening where she needs to be. All in all, a magical album fortunately not too late for the approaching “end” of Mayan time! And judging by the cultural wealth of the material Haladyna takes up, there’s no cause for worry. Part of the reason much of this music sounds so strange, perhaps, is the weird scale Haladyna uses for several of the pieces. While microtonality should be nothing new to this audience, Haladyna's "Luubscale," however, most definitely is. A musical analog to the Mayan calendar's attempt at synchronizing the cycles of Earth and Venus, which converge every 104 years, the Luubscale is an octave-less 39-pitch system featuring intervals which have no correspondence to any other tuning system and that stretches across the entire range of a piano. There are clearly discernible melodies and harmonies, but ones which are completely without any recognizable context. But the pitch content of this music is not all that's odd about it. Complex Mayan mathematical schemes also suggest rhythmic relationships and the means to generate them. Many of the compositions feature turntable scratching, but it has nothing whatsoever to do with an attempt at hip-hop crossover. Rather, as Haladyna explains in his rather extensive CD booklet notes, it is yet another way to express the difficulty in aligning metacycles. "Live" passages and "recorded" passages contain the same basic material, but they're never exactly in synch. In addition, the compositions featured on the current disc alternate between electronic works using this bizarre scale and compositions for acoustic instruments in unusual combinations—e.g. alto flute and celesta, multiple ocarinas, plus oboe and organ, which feels like the ominous soundtrack for an inquisition. More on that anon. The only standard instrumentation anywhere among the present selections is for Only Armadillos They Danced, scored for string quartet. But any attempt at normalcy therein is thwarted by Haladyna's pitting the members of the quartet against a turntablist for a session of, as he aptly describes it, "scraping and scratching." All in all, it's a very thoroughly conceived sonic universe. However, whether or not any of these devices are perceptible—I had no idea what this music could possibly be about before I read through the notes—is ultimately beside the point. The results are simply fascinating. And what they do convey beyond a shadow of a doubt is a total alien environment, and in so doing serve as an excellent metaphor for the deep cultural chasm that exists between our present society and the pre-Colombian world of the Mayans. Theirs is a world that, despite the pseudoscientific posturing of the 2012 doomsday proponents, we can never completely know thanks to the vicious Inquisition tactics of the missionaries and colonizers. Indeed, also thanks to those same conquistadors, what little we do know of the Mayans is at times admittedly extremely scary—a world of secret human sacrifices and ritual cannibalism. Haladyna ventures into that terrain very effectively on Puczikal Peten ("Hearts of Yucatán"), the final track on the disc and the only one which features a text—a reading of an eyewitness account from the year 1562 narrated in a deadpan matter somewhat reminiscent of The Velvet Underground' classic recording "The Gift."